Origin PC demonstrated its all-new Cube desktop machine at CES. The fully-upgradeable computer comes in an all-glass compact chassis that can house a standard-length video card, a liquid-cooled factory-overclocked CPU from AMD or Intel, and seven storage devices. Measuring 28.6×27.3×33 cm (11.25×10.75×13 inches), the Origin Cube PC chassis features three compartments. One to house a Mini-ITX motherboard with an installed CPU and graphics card, one for a radiator of an liquid cooling solution and with seven storage devices, and a third for a PSU (probably featuring an SFX form-factor). 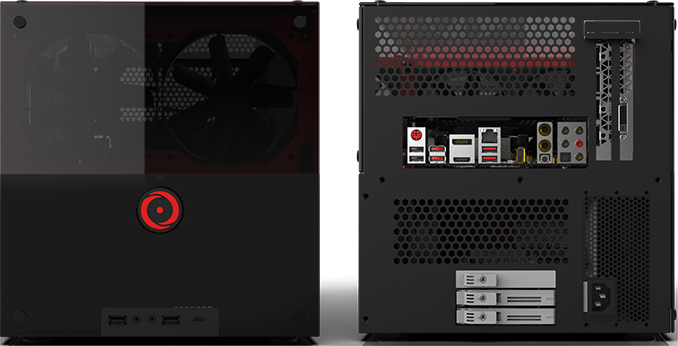 The case is compatible with standard-length graphics cards, has three 2.5-inch hot-swappable bays for HDDs or SSDs, and four more bays for storage devices (the manufacturer does not disclose whether these are 2.5-inch or 3.5-inch bays, but the former are more likely to be there). From a feature set point of view, we expect Origin PC’s Cube to offer similar capabilities as today’s high-end Mini-ITX platforms including support for enthusiast-class CPUs form AMD and Intel, one or more M.2-2280 PCIe 3.0 x4 slots for SSDs, 802.11ac/802.11ax Wi-Fi, several display outputs, multi-channel audio, Thunderbolt 3 (depending on the motherboard), USB Type-C, and so on. 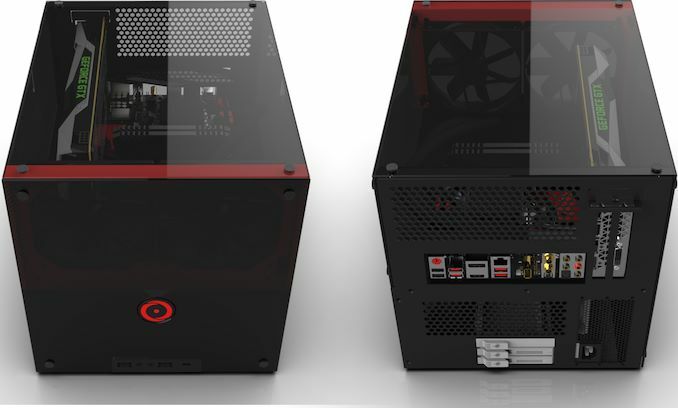 To ensure proper cooling of the processor and the graphics card, the Origin Cube PC has two large fans for air intake in addition to internal fans. Origin PC did not say when exactly it plans to release its Cube PC, but since the company demonstrated it a large trade show, its development is in final stages and we are going to see it rather sooner than later. Origin PC was among the first boutique PC makers to offer small form-factor gaming desktops, and it did so under its Chronos brand. Origin prides itself on well-thought configurations, professional assembly, and expert factory-overclocking. Since the PCs come in off-the-shelf cases, it is sometimes difficult for Origin PC to differentiate from its rivals. With a bespoke all-glass cube-like case, the boutique PC maker aims to offer high performance and an exclusive look. This case will be able to be further customized with UV printing, laser etching, and custom paint. First, this is not "all glass", though that's probably a good thing since this is already going to be heavier than yo' momma. +1 for the yo momma joke.